Now that the internet has brought the world together into one big, meme-based family, everyone is aware of a pop-cultural event on the scale of the sad, ongoing saga of Bill Cosby and the many sexual-assault allegations that have been leveled against him. Even at the Minnesota State Fair. 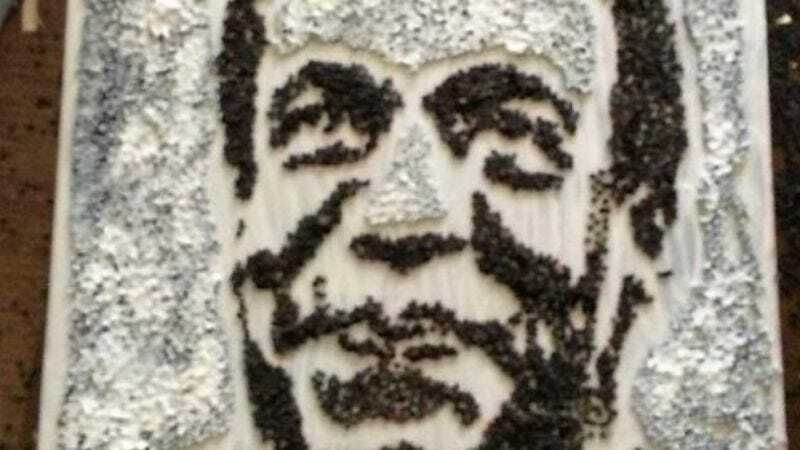 37-year-old artist/software designer/smartass Nick Rindo is taking full responsibility for one of his recent works, a portrait of Cosby make out of canola seeds, a.k.a. rapeseed. Rindo made the portrait as a joke to display at the Minnesota State Fair alongside his other, more earnest submission, a crop-art portrait of recently deceased Star Trek star Leonard Nimoy. Expressing surprise that the fair accepted the portrait to begin with, Rindo tells TwinCities.com that he meant for the picture to stir up trouble. “The point was just to see, would there be outrage?,” he says, presumably with an impish grin on his face. Regardless, “longtime crop art superintendent” Ron Kelsey approved Rindo’s rapeseed art for display, but with one minor change: He put a piece of tape over the word “rapeseed” on the label. (“We call everything canola in this country,” Kelsey says, suggesting that Rindo can take his ironic seed-based wordplay to Canada where it belongs.) But the tasteful application of masking tape was not enough to make the whole thing, well, tasteful, and after a flurry of complaints from fairgoers the portrait was taken down after one day. Speaking of irony, this isn’t the first time someone has displayed a rapeseed portrait of Cosby at the Minnesota State Fair: That was in 1995, when crop-art luminary Lillian Colton depicted the same subject using the same materials. The outcome was somewhat different.